4 Easy Steps To Improve Your 10-yard Dash And 40-yard Dash. Improving the athlete's 40-yard dash time in a matter of minutes is possible. Here are some steps to improve your sprint time. When I played college football, it amazed me how many of my teammates had no clue how to optimize their sprint times. Their technique is poor, their starts are awful, and they think they are OK! And their high school coaches are "know-it-alls"! While I was a player, several teammates approached me to help them improve their 40-yard dash (one was a legitimate draft pick). The situation required a quick fix for speed. I had no time for a training program so I had to look at their technique. 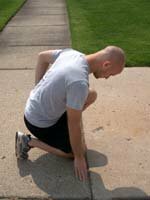 I have found that most football players untrained in sprint technique make four common mistakes. The starting stance and "set" position of the athlete is crucial. Improper form here will result in a super slow time. To begin, the athlete needs to decide which foot goes in front. 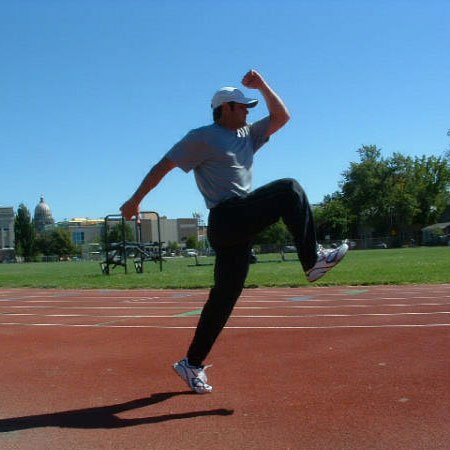 A simple test is to have the athlete stand upright with both feet together. Moderately push the athlete in the back and watch which foot moves first. The foot that moves first should be their rear "quick" leg. The other leg will be called the "drive" leg or "power" leg. For athletes shorter than 6-feet tall, place their "power" leg just millimeters from the start line. Athletes taller than 6-feet should play with their stance for the best time. Most athletes at this height place their "power" leg about 4-6 inches behind the starting line. The front foot is placed close to the starting line because this places the body&apos;s center of mass (about the belly button) almost over top of the starting line. Since the idea of the sprint is to get the body&apos;s center of mass from point A (start line) to point B (finish line), you want to eliminate as much distance as possible without sacrificing power and speed. 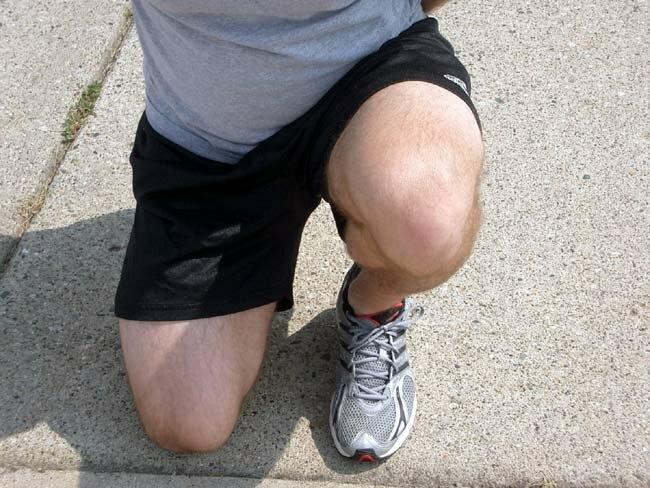 Bend the opposite knee to the ground so the front of the knee almost touches the starting line. Take the hand that is to the "quick" leg side and place it on the ground (I have seen college athletes do this backward!). Place the opposite hand near the hip so it is "cocked" and ready to "fire!" The coach should view the athlete from the side and make sure the athlete&apos;s hips are above their shoulder height. The athlete&apos;s eyes should be focused on a spot on the ground about 2-3 feet in front of them. If the athlete&apos;s hips are not higher than their shoulders, their legs need to be re-adjusted. Most athlete&apos;s feet are too far back because it&apos;s "comfortable." In the "set" stance, the athlete should feel cramped for maximal recoil. Some athletes cannot achieve this position because they have flexibility issues. If time permits, this should be a focus of the training. If you have little time, do the best you can with what you have to work with! Notice how close the knee and foot are to the starting line. The hips are above shoulder height. Notice the 90-degree bend in the rear knee and approximate 120-degree bend in the front knee. The hand is placed millimeters from the starting line and the "cocked" arm is ready for explosion. A poor first step is the result of a poor stance. Having your feet too far back will result in a step that may not pass the starting line which results in one extra step to run the sprint, which could add 0.1 seconds to your time! If flexibility (addressed above) is not an issue, practicing the start from the new stance is the next step. 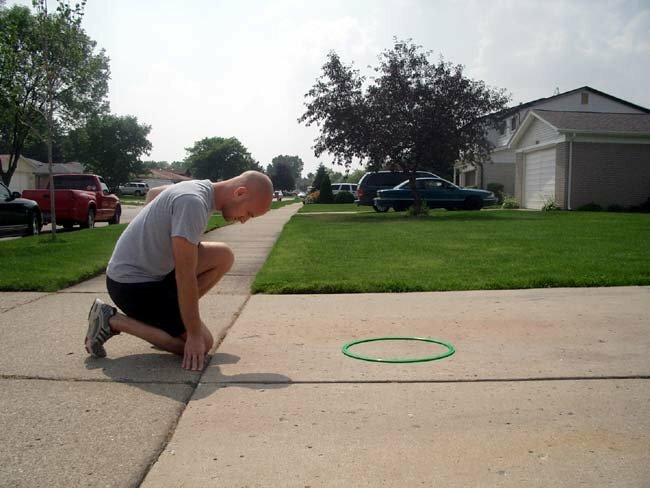 Set a hoop or line of tape on the floor to help as an aiming point. How far should the athlete step? I was pretty flexible and was able to get a large first step without sacrificing body angle. This is up to the coach to decide. A good starting point is to measure the athlete&apos;s femur length and use that as the optimal distance. This keeps equilibrium for the athlete&apos;s height (taller athletes have longer legs and vice versa). Practice several starts and get an idea where the first foot contact is. A short step means the rear foot is too far back. Too long of a step results in an overstride which decreases force potential. The best way to be sure if the stride is too long is by using a video camera. It doesn&apos;t have to be a fancy set-up. You just need a VCR that plays in slow-mo. Pause the tape when the athlete&apos;s foot contacts the ground. You can even use a protractor to measure the leg angle. An optimal leg angle would be about 45 degrees. 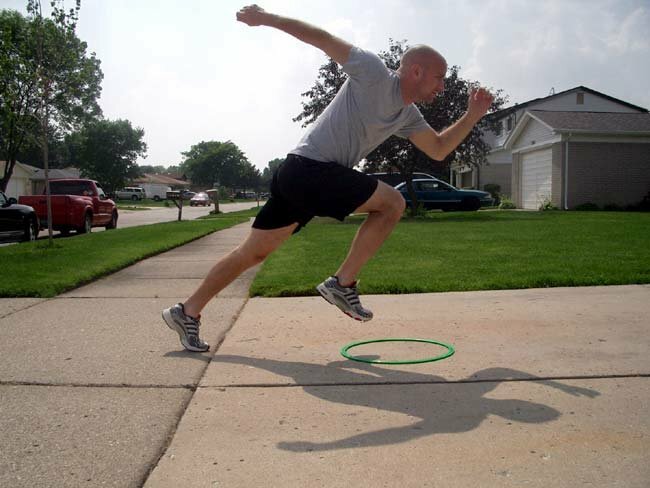 The athlete in the set position - The hoop is approximately where the first step should take place based on the guidelines mentioned above. This is a great picture for teaching basic start principles. Notice the front leg&apos;s angle relative to the ground. That angle is what helps the athlete accelerate. A leg angle perpendicular to the ground would result in lost speed. Notice the front arm exploding. The body angle is forward. The back arm should be bent, not straight. The 40-yard dash is a test of acceleration and top-end speed. Research suggests that top end speed can be maintained in elite sprinters for about 2 seconds and occurs around the 50-meter mark. Knowing this fact, timing top end speed is critical. Most 40-yard dashes by elite football players are less than 5 seconds. The athlete should try to reach top-end speed about one second from the finish. This normally occurs around the 30-yard mark. The athlete needs to keep an exaggerated forward body lean for 30 yards. The forward lean keeps the athlete from reaching full speed too fast. 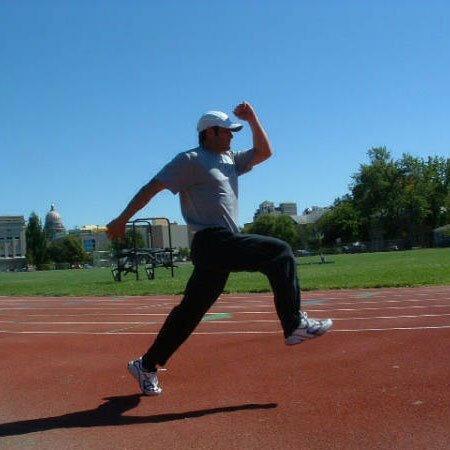 During this acceleration phase, the athlete should focus on keeping arms bent at about 90 degrees and focus on "pulling" the elbows back and "pushing" with the feet. Trying to "pull" back may result in a hamstring pull and also a slower time. At the 30-yard mark, the athlete&apos;s posture is upright and the focus is still on pulling the elbows back. By only focusing on the arms, you will also control the stride rate (the legs will only move as fast as the arms will pump). The final point about the acceleration phase is that the athlete should have his first breath just before coming out of the acceleration phase. Normally a quick grunt is taken at the start of the sprint. The second breath should come at about the 20-yard mark and the final breath taken just before the finish. The final common mistake is that players take way too many steps. The 40-yard dash should be over in about 18-20 steps for high school players and older (If you have seen programs to reduce 40-yard time by 0.2 seconds, they take 20 strides and try to reduce ground contact time but 0.01 seconds x 20 strides = 0.2 seconds). However, counting an athlete&apos;s strides is not an easy task. The simplest lo-tech way to count steps is to start with the first step and count every other step. If the right leg is back, the first step is 1, then when the right foot hits again, 3, 5, 7, 9 etc. When the athlete crosses the line, notice what foot crosses and make your final count. A more accurate method uses the camera. Count the steps in slow-mo on the VCR. If the athlete takes too many steps, their stride is not optimally lengthened. Coaching the athlete to reach farther while running may give instant success. For those with training time, focusing on exercises to improve stride length would be a main focus (stadium steps, step ups, alternate leg bounds, over speed bands). If the athlete has too few steps (a rare symptom but possible), the athlete is normally tall and takes large strides. 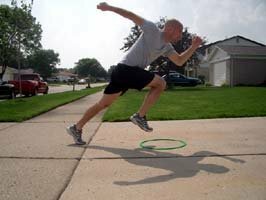 If the angles on ground contact are poor, focus training on stride frequency to find the cure (quick feet, assisted sprints, parachute runs). Improving the athlete&apos;s 40-yard dash time in a matter of minutes is possible. The amount of improvement may only be 0.1 seconds but that could be the difference between being drafted and being on the couch in the fall. Tips On Improving Your 40-Yard Dash! The 40-yard dash is tested in almost all sports now. Whatever your sport the mechanics remain the same. Here are some key pointers to lowering your time. Understanding that each athlete is unique is important. Also, focusing on the weakest part of the sprint should be the coach&apos;s focus. Overteaching may result in a worse time. Roger White BS, CSCS, SSC, is the Head Speed Coach for Sport X Training. For questions, e-mail Roger at Roger@SportXTraining.com. For more tips like this, visit www.SportXTraining.com.